Photo: Mac Garnsey, Vail Valley Foundation. What’s the song that gets you most fired up? The International Ski Federation (FIS) has approved the course for the 2018 Xfinity Birds of Prey Audi FIS Ski World Cup and the races will go on as scheduled Nov. 30 (super G), Dec. 1 (downhill), and Dec. 2 (giant slalom). Ski racing fans are jumping for joy as the Xfinity Birds of Prey course has passed snow control as of Nov. 16, 2018. 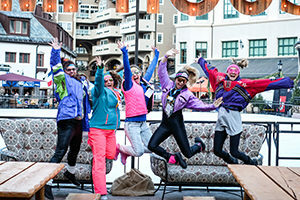 The event takes place Nov. 30-Dec. 2, with surrounding festivities kicking off with the 80s ski welcome party with special guest Ted Ligety starting at 4 p.m. Thursday, Nov. 29. Photo by Rick Lohre. This means the Xfinity Birds of Prey races are officially ready to go – and along with them will come a weekend full of concerts on the Tin Cup music stage, an ’80s welcome party Thursday Nov. 29, the Beers of Prey seasonal beer tasting Saturday Dec. 1, kid’s activities throughout the weekend, a Warren Miller movie screening at the VPAC, and a whole lot more. Learn more about all the festivities surrounding the Xfinity Birds of Prey Audi FIS Ski World Cup here. Course officials said the legendary Birds of Prey course, which was ranked No. 1 overall on the Audi FIS Ski World Cup tour by an independent survey of athletes and coaches, was in perhaps the best condition in its history dating back to 1997. The news of a positive snow control comes as Beaver Creek mountain prepares for one of its best-ever season openings. Beaver Creek will open Saturday, Nov. 17, four days ahead of its scheduled Nov. 21 opening date. Beaver Creek will open the mountain all the way to the top with intermediate terrain on Gold Dust accessed via Centennial Express (#6), plus beginner terrain in Red Buffalo Park accessible via the Cinch Express (#8) and last year’s new Red Buffalo Express (#5), and Haymeadow Park and the Haymeadow Express Gondola (#1). Opening day festivities will include a special Cookie Time in the morning. It’s enough to make us want to crank up the speakers and celebrate for a little bit. Our choice for tunes? Of course, we are going with something from the ’80s as we get ready for our Thursday Welcome Party. Crank it up, see you soon, can’t wait!